The most comprehensive way to learn Adobe Encore DVD 2.0! 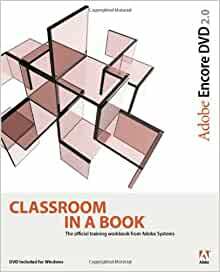 Adobe Encore DVD 2.0 Classroom in a Book contains eleven lessons and a bonus DVD with lesson files. The book covers the basics of learning Adobe Encore DVD, and countless tips and techniques to help you quickly become an Adobe Encore DVD artist. You'll learn to create DVDs with advanced features such as interactive menus, multiple audio tracks, and subtitle tracks as well as learn about Encore DVD 2.0's new features, including a slideshow editor, flowchart, updated user interface, Adobe Bridge, automated chapter menus, and more. You can follow the book from start to finish or choose only those lessons that interest you. I have the complete CIB series for using the Adobe DVD Authoring software. The Premiere Pro 2.0 is exceptional in learning how to use the software. This book, however, falls significantly shorter. It is hard to figure out how everything comes together. Perhaps if one of the first lessons could be the actual making of a menu and then come back in the later chapters to embellish them with the additional ammenities may have helped. I made it to chapter 4 and still am fully confused by this training. I am plugging along only because I want to see what the software has, but not sure if it will "come together" with the later chapters. I can hope. I would have given a 3 but my pet peeve for computer training books is that most publishers fail to make a book binding that will fold flat so the page you want stays open. How come nobody can seem to make a "how-to" book for computer programs that do this? If you have to use software, you need both hands for the keyboard/mouse and do not want to hold the book open and you are trying to learn. Thus it is a 2 rate for this one. Maybe my confusion will clear up when I get to the end. If so, I will post it as well. Despite other titles in the "Classroom in a Book (CIAB)" series being exceptional, this book falls a little short. While other books in the series contain full color and over 400 pages, this one is Black & White and just over 200 pages. The training moves very slowly at first and does contain examples of most of the features of the product. I just feel that the organization of the material is a little weak and after using the Premier 2.0 CIAB and just looking at the After Effects 7.0 CIAB, that came today, I find it a weaker effort. Admittedly, I did need to get a DVD authored prior to getting too far into the book, but I feel it could have really been improved with Color. The book and CD were in good shape and arrived in a timely fashion. The book was exactly what I wanted. This book teachs you what you need to know on how to create a professional DVD. I also enjoy the chapter about "easter eggs". It is a valuable acquisition. Like the previous reviewer, I found the lessons difficult to follow. The text is cumbersome and the illustrations are poor. I still believe Encore DVD 2 is a great product, but if you are looking to learn how to use it with this book, I would suggest saving your money and continuing your search. I bought this book because, as an absolute beginner in the world of DVD creation, I couldn't figure out how to do most anything with the software. This book gave me the leg up I needed; now I can figure the rest of the program out myself (which is the point of the CIB series, anyway). I didn't find the lack of color pictures a problem at all; the B&W photos are very clear. In all, I think it was a good buy. Since I am required by my class to have this book, and the school bookstore was out of it, I came to Amazon looking for it. I was pleased to find it at about half the price of school. If they have it here, you will more than likely save money on it.